Guys Lit Wire: More Interspecies Communication! She describes dogs' use of their tails, and how to know their feelings from watching them. Which made me think of Choo-Choo, our Amphibious Rat-Dog (which is not an AKC-recognized breed, by the way). Choo-Choo's tail was broken, and she couldn't wag it. Dogs that were three or four times her size were frightened of her because she didn't do the happy tail wagging. Seeing them cringe and whimper was always pretty funny. "Do not stare; a stare is a threat. "You can pass other messages with your eyes. Think 'I love you. I love you,' and your lower lid will involuntarily come up and soften your expression. Your dog will read that and return this message by softening his eyes." And she says some dogs have a different bark for each different animal they are tracking. 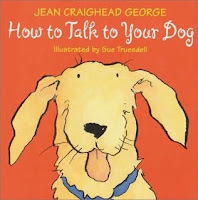 "By listening, you know whether the hound is following a deer, rabbit, raccoon, or squirrel. "Although it is fun, it is not very rewarding to bark at your dog. He doesn't understand your bad accent and may twist his head and look at you in confusion." Humans and dogs have co-evolved for a long, long time. 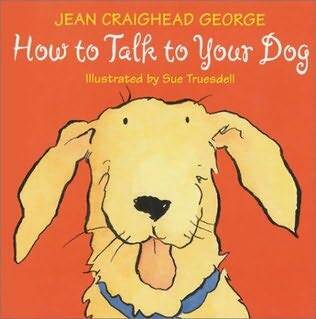 It is so cool to know How to Talk to Your Dog.